College can be stressful and tough. You're going to want to not only make your college dorm room comfortable and feel like a home away from home, you're also going to want to add some inspirational dorm essentials to your college supplies. Some of the most inspirational dorm necessities are, believe it or not, college posters! These cheap dorm supplies can actually add a lot to college wall decor. Your college dorm room will feel more homelike when you make those college dorm room walls less plain and you'll be able to have inspiring dorm items surrounding you every day to get you through the tough days. 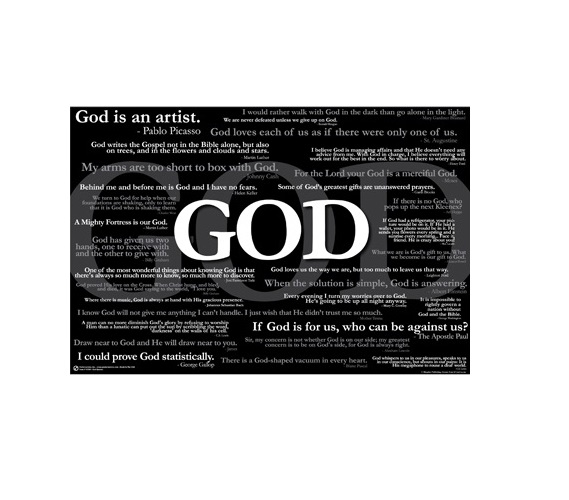 Our God Quotes College Poster is one of the most inspirational dorm wall art items to have in your college wall decor! This dorm room decorations item has a cool look that is relaxing and soothing. The design of this dorm necessity isn't just soothing - the quotes on this dorm wall art item are soothing as well! 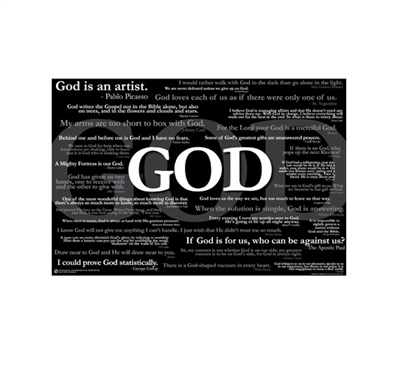 This college wall decor item features plenty of quotes from famous people and from the Bible about God in white and soft gray print. Centered in this dorm room poster in bold white lettering is "God" and it is also centered in large gray print in the backdrop for a super cool look for your dorm room decor!